Apply Now Merchant support via phone, ticket, and chat available 24/7! Chat now. Volusion Payments is designed to fully complement your Volusion store, allowing you to receive funds faster while promoting customer confidence. For more information, download the Credit Card Acceptance guide. You will not be charged for statement or PCI fees. Rates start at a low 2.15% and $0.30 per transaction. Most applications are accepted the same day they are submitted. Does Volusion Payments process orders if I live outside of the United States? At this time, Volusion Payments is unavailable to merchants outside of the United States. The good news is that we have several partners that can help meet your payment needs. Simply contact us for more information and we’ll help get you started. This is my first business. Am I still eligible for a merchant account through Volusion Payments? Yes. Volusion's credit team works with thousands of new businesses owners every year to become online merchants. 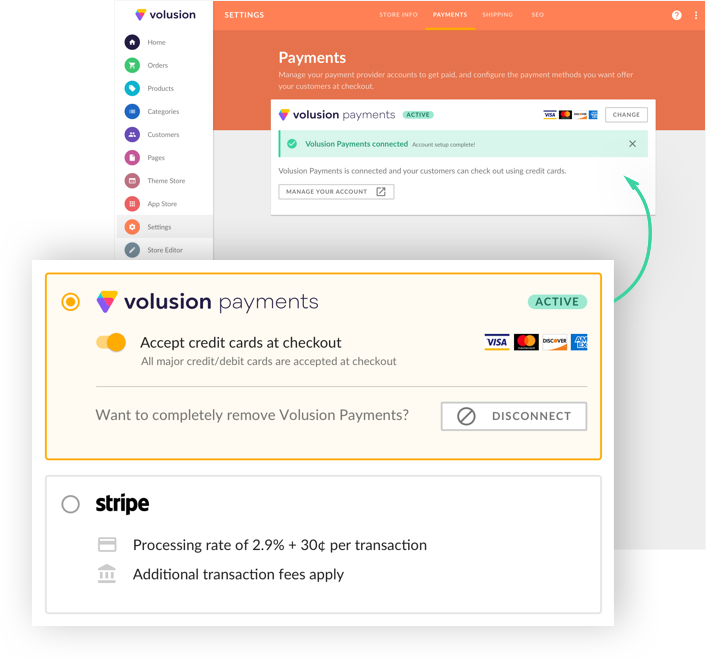 In general, what is the approval timeframe for receiving access to Volusion Payments? Most applications receive approval within 1 business day. Can I have multiple websites with one merchant account? No. Due to credit card processing regulations, you can only have one storefront for each merchant account. Can I accept American Express and debit cards with Volusion Payments? Yes, accepting debit cards is a built-in component of Volusion Payments. You can also easily indicate whether or not you’d like to accept American Express on your application. Once your application is approved, you will be notified by your sales representative and also in the Settings section of your Admin Area. Do I need an SSL in order to be approved for a merchant account with Volusion Payments?